Remember Gnome2 Global Menu? It's an applet that adds a global menu (the menu is displayed on the top panel) for Gnome 2 that wasn't very active for a long time because Ubuntu built its own global menu. But it's back! The new GTK3 Gnome Global Menu only works with GTK applications (both GTK2 and GTK3) - so don't expect LibreOffice, Firefox or Qt applications to work, at least not yet. 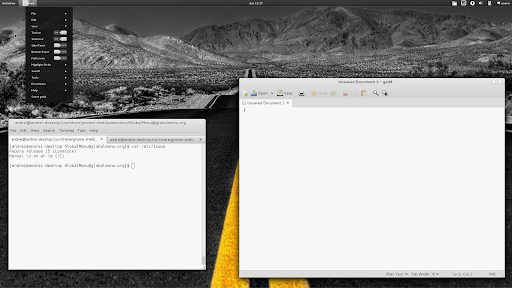 Also, it doesn't work with all GTK applications yet - I've only found one for now: Shutter, but there might be more. Gnome Shell global menu is available in AUR for ArchLinux users but if you don't use Arch, it will take quite a few steps to get it working. I've tried to make a how-to for Ubuntu / Fedora (tested in Ubuntu 11.10 with Gnome Shell 3.2.0 and Fedora 15) but there are quite a few things that could go wrong so you need to have some knowledge about compiling applications to get it working. Before proceeding, you obviously need to install build-essensial, etc. 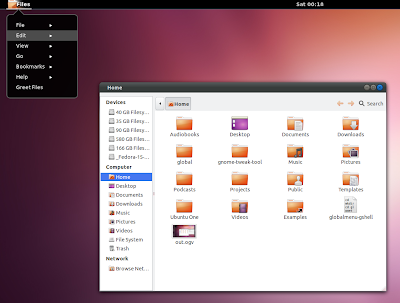 Important: GNOME Shell Global Menu is currently in alpha so expect to find lots of bugs! If you get an error about Vala not being version 0.12, remove Vala 0.10 and make sure 0.12 is installed (step 1). 6. 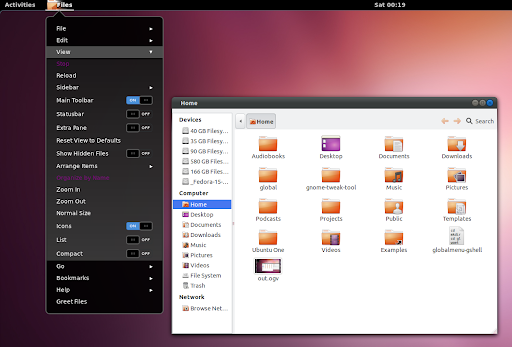 Now open GNOME Tweak Tool (install it in Ubuntu: sudo apt-get install gnome-tweak-tool) and enable the Global Menu extension. 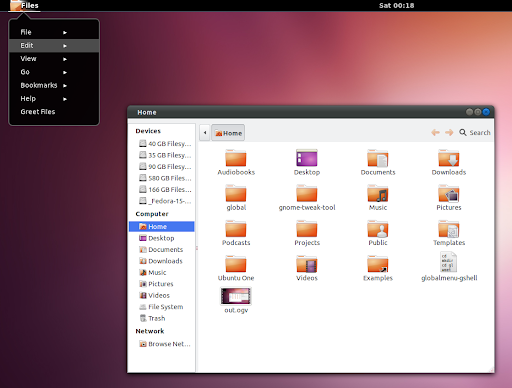 For GNOME Shell 3.0.x, you also need to restart GNOME Shell or log out and log back in. Gedit should now use a global menu. Go to /usr/share/gnome-shell/extensions/GlobalMenu@globalmenu.org and make sure the Gnome Shell version inside the metadata.json file matches your Gnome Shell version. After making modifications to this file, make sure you restart Gnome Shell and check Gnome Tweak Tool to see if the extension shows up. Instructions based on ArchLinux forums and Aur Package - thanks! A big thanks also to Erkka Juhaninmäki for the tip!